Most of you have probably tried to get better at running or rowing or whatever it is that you think you struggle at. As the old saying goes “There’s a million ways to skin a cat”. Same thing when it comes to capacity or “cardio”. Some people believe in getting miles under your belt and just doing more work will help. Others believe you should be pushing your pace and going faster than you normally would to build that capacity. Others rely on heart rate monitors and changing your pacing or performance based on your heart rate. All of these options will work, but it depends on what your goals are and what will work best for YOU. The video below is more on the heart rate realm, but there still is some good information. The only problem is you may not be able to get this kind of information unless you have one of these machines. The good news though is it starts to make you think about maybe what tests could you perform to get an idea of where you’re good and bad? On to week 3 of our back squat cycle. You guys got the feel last week, we want the same things happening this week. Make the warm up reps pretty and perfect. As it starts to get heavier strive for perfect movement, focus on the task at hand and it will pay off I promise! Lets get the week started off on a good foot! If you are still feeling like you’re struggle with the squat, the video below might be some help. This is a 4 part series, but i’m sure if you struggle with the squat then you struggle in one of these areas. You’d be shocked how many people have super stiff ankles and don’t realize that is so important in the squat. It’s worth a watch! Hopefully the weather allows us to get outside and enjoy some fun this weekend. Or hopefully you have some fun plans for the weekend. Either way try and get out and experience something new! Life is short, might as well have some fun! If you hit up today hopefully you guys enjoy. Have a great weekend! *Each round add 10/5 to bar. Round 1- 95/65. Round 2- 105/70. Round 3- 115/75 and so on. Quick Henoch is a super smart dude. If you don’t know who he is I’d take a listen. Has a different way of thinking, doesn’t believe in just foam rolling and banded distraction to get the job done and move better. And he still gets results, pretty interesting! Since yesterday we did an article on power cleans I figured today’s podcast would fit right in with the theme of yesterday. Take a listen, while you drive to work or heck even listen at work or while you’re cleaning the house. Learn a little something new on a Thursday! Today we get a quick workout, low reps for the most part and should be approached with a sense of urgency. When it comes to the skill work after, we urge you to try something a little new today. If you know you can handle handstand holds on the wall, then maybe try some free standing handstand holds instead. Just another layer to add in some difficulty and try something a little new. It’s okay if you won’t be perfectly still, live in a 6 foot x 6 foot box and that’s a start. The video below has some good tips for you who might be curious on how to go about it from the wall to the floor without any assistance. Don’t be afraid to practice some of these options after class or throughout the coming weeks. The handstand hold is a skill just like anything else. Perfect it on the wall before adding more complexity. There’s a reason that we play around with odd objects such as kettlebells, dumbbells, sleds, tires, etc. Of course the fact that is something fun and new can be one reason, and probably a big one for most people. Takes away the boredom of always using a barbell. The other reason could be it tends to keep you a bit healthier. Doing new movements with maybe lighter loads than a barbell teaching the body to be even without any imbalances. Another reason like the one stated in the article, is that life’s tasks are never balanced. Go into nature and lift up a log or a rock, chances are it won’t feel and be even like a barbell. Since life is like that, we should be ready for it and not just really on being able to lift a heavy barbell, but struggle to lift a rock or a tree or a tire. The tires were arranged from lightest to heaviest. We’d just listened to the introductory lecture of the CrossFit Specialty Course: Strongman in the outdoor space at Deuce Gym in Venice, California, and we were warmed up and about to try out our first strongman movement. I don’t have any experience flipping tires, so I figured I’d start with the lightest one, and then, as I do with a barbell, move up in weight. I put my chin on the tire, placed my hands under it, sunk my weight in my toes and lifted. Nothing. The tire didn’t budge. I set up again, moving my feet back from the tire, trying to use my legs and hips and not my arms. After a fierce effort—and a moment when I was sure it was going nowhere—I got the tire up. I continued to work with this tire, and I’d fail each time I’d foolishly attempt to lift it with my arms. Then I’d sink into my toes, push again with my legs and the tire would slowly rise. I never moved to a heavier tire. I’ve been doing CrossFit for six years, and most things in the gym are familiar to me. I know what movements I can do and I know how much weight I can lift. I’m not the strongest or the fastest, but with all that familiarity comes confidence—and probably some complacency. Definitely a bit of ego. That confidence disappeared the minute I struggled to lift the lightest tire, but when it went away I felt a sense of relief. Free from any expectations about how I was supposed to perform, I could relax and learn. Although these movements seemed very different from what I was used to, by the end of the day I found they had taught me some fundamental concepts I’ve been struggling to learn for years. The course I attended in October was led by Logan Gelbrich, a 6-foot-3 former professional baseball player, and Emily Russak, a 6-foot-1 former collegiate rower and middleweight winner of California’s Strongest Woman in 2016. Both are tall, powerful-looking individuals who are very strong. But only Gelbrich is a man. And therein lies one of the problems with the “strongman” name, Gelbrich said. “People think of strongman as big dudes, like Brian Shaw, who is 6’8” and weighs 435 pounds. That’s not good for marketing, and that has nothing to do with any of you,” Gelbrich said to the seminar attendees, referencing the four-time winner of the World’s Strongest Man competition. The reality, Gelbrich said, is the stereotype of the giant, bearded strongman only accurately represents a small percentage of the sport and the movements. 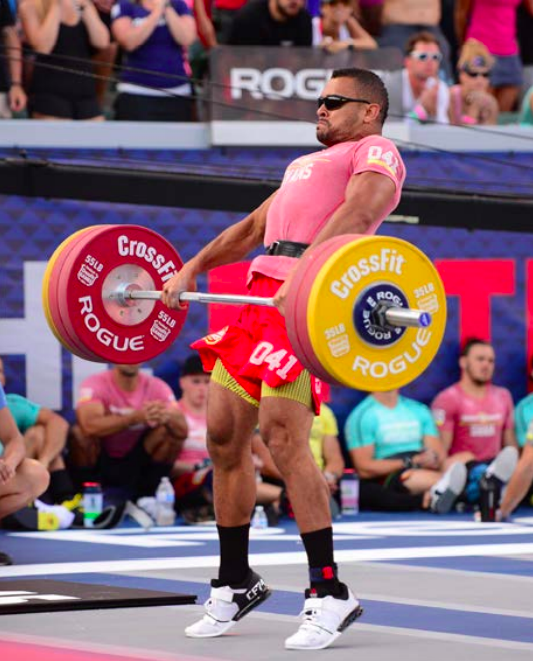 Gelbrich—who has been doing CrossFit since 2006—first experienced strongman movements in 2013 at CrossFit Ethos with CrossFit Strongman subject-matter expert Rob Orlando, and he was impressed. Strongman movements, he said, are very natural. What makes rowing popular with elite athletes and CrossFitters is exactly what many in the general fitness population dislike about it: your weaknesses cannot be hidden on the rowing machine. It is a human polygraph of physical and mental performance. Stroke for stroke, you are provided with feedback that both reveals any weak spots and very visibly demonstrates the relationship between performance and proper technique. If you want faster times, better scores, and superior performance, work to improve your rowing technique so you can harness your full potential. Rowing engages all the major muscles of the body and works multiple joints through a large range of motion in a natural, powerful sequence in a no-impact manner. However, proper rowing technique is not an innate skill; mastering it requires instruction. The rowing stroke is very similar to a deadlift. In the drive (work) phase, the legs initiate the power, and arms remain straight. Then the hip flexors and torso muscles maintain the power through the leg and hip drive. Finally, the arms finish the stroke with an accelerating pull toward the torso that completes the smooth handoff of power from lower body to torso to upper body. The handle and seat must move together during the drive. A common error is to pull with the back early, which is evidenced as the handle moving first. Just as the bar and hips must move together during a deadlift, so the handle and seat should move together during the work phase of the rowing stroke. On the recovery (rest) phase of each stroke, the handle leads the body forward. The arms extend first and then forward flexion occurs at the hips. You should feel your body weight shift from the back to the front of the seat as forward body angle is achieved, before the knees begin to rise and the legs compress for the next stroke. Be sure to watch the position of the knees at the catch (the “front” of the stroke, just as you are about to apply drive power). Many new rowers will attempt to open the legs, i.e., flare the knees outward, to try to achieve deeper compression at the beginning of each stroke, but this action will bring the knees out of alignment with the ankles and can cause injury with application of force or repetition. As you reach forward for the catch, your shins should be essentially vertical and aligned with your feet.